It's valentine making time! Once again Lorraine Miller-Wolf will lead February's workshop to make valentines to distribute to senior lunch sites, kidney dialysis patients, people living in local convalescent and board and care homes, and participants in the Senior Nutrition home delivered meals program. This is her 13th year spearheading this very worthy project so let's help her make it a lucky 13 and surpass last year's contribution of nearly 600 valentines, many made by NORBAG members. 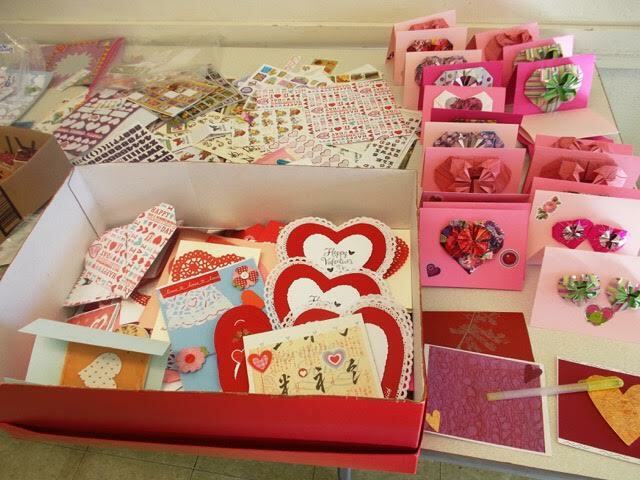 If you can't come to the meeting/workshop, but would like to donate your original valentines, just contact Lorraine. Her contact information will be in the newsletter. 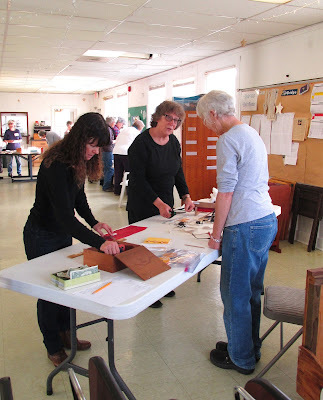 On Saturday, January 13, we had a great meeting and workshop. We had 24 members attending and 16 books in the exchange. During the business part of the meeting we found out that Michele O. and Sandy V. are both giving classes at the Osher Lifelong Learning Institute at Humboldt State this spring. 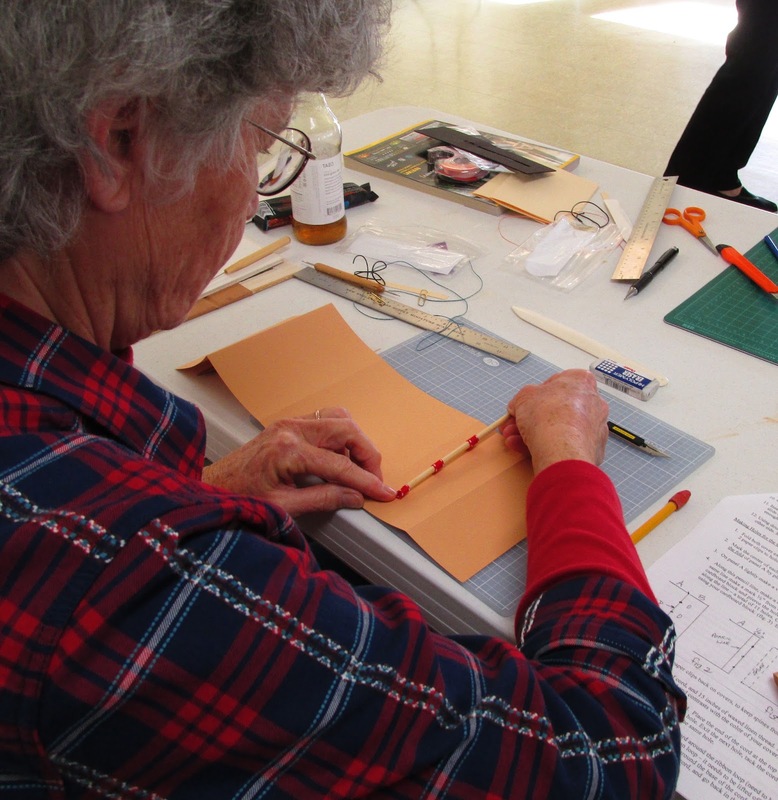 We welcomed two new members, Roz K., who submitted her first book for the monthly exchange and Marie B.
Dolores G. led the workshop demonstrating a "Cord, Ribbon, & Stick" closure book. Dolores learned the closure in a workshop in the UK taught by Lori Sauer. 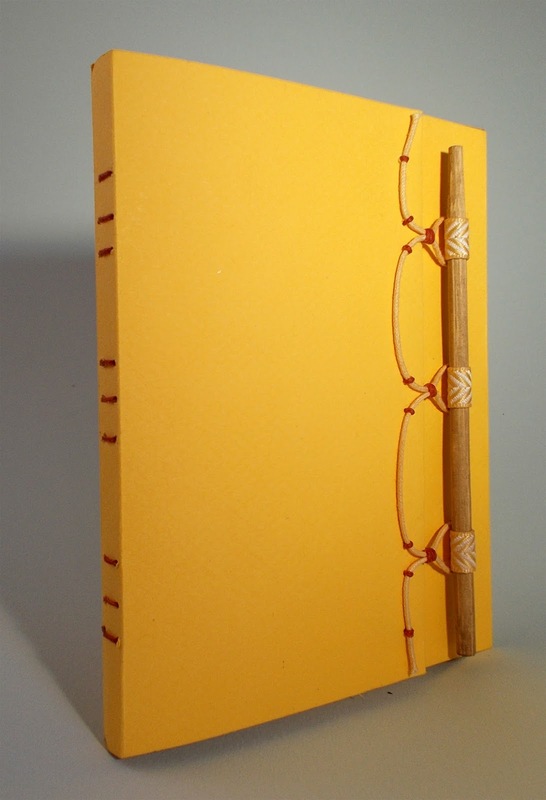 The signatures were bound with a Keith Smith binding called “Parallel Bars”. We brought our own cover paper and Dolores supplied all of the cording, ribbons, sticks, and linen thread. First we chose the ribbon, cord and thread for our books. We started by scoring the cover. It allowed for a spine and and other folds. We made three slits on one side of the front cover to put the ribbons through. They will form a loop that will hold the bamboo stick. 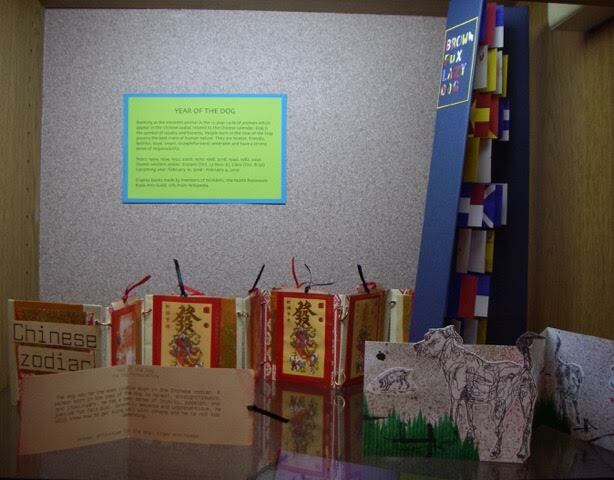 We adjusted the ribbons so that they were the right size to hold the bamboo stick for the closure. We taped the ends of the ribbons to the inside of the cover. and used tacking to connect the cord to the cover. we made the final adjustments aesthetically. the cover to form three horizontal bars that mirrored the spacing of the closure. 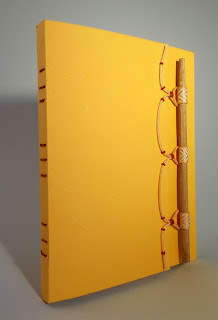 The tacking of the cord to the surface of the cover demonstrates a technique that can be used for other applications-- whether it is a closure, a decoration, or even a binding. The folding of the cover also lends itself to various other sizes as well as materials. 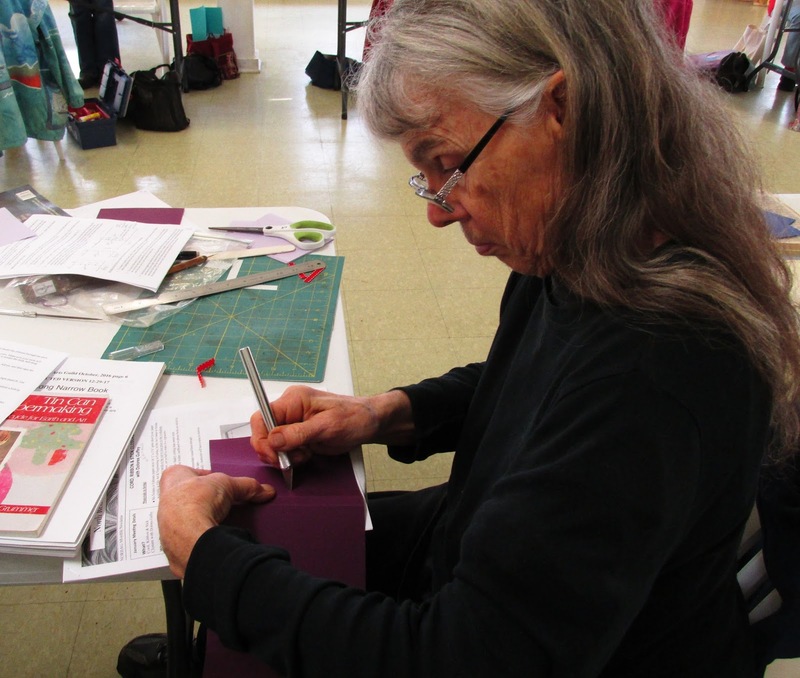 Because the signatures will be sewn through the cover spine, this lends itself to many different sewing patterns. 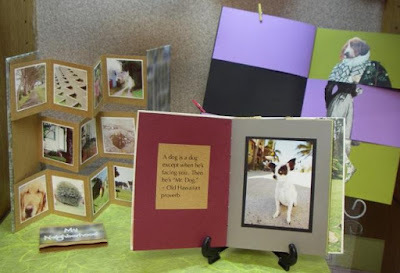 All of us made the same book with a solid cover. Look at each picture-- there are quite a few differences. Some members used high contrast colors, or unusual color combinations. but the tacking stitches look almost like little jewels. you can see the instructions with lots of diagrams for "next time". 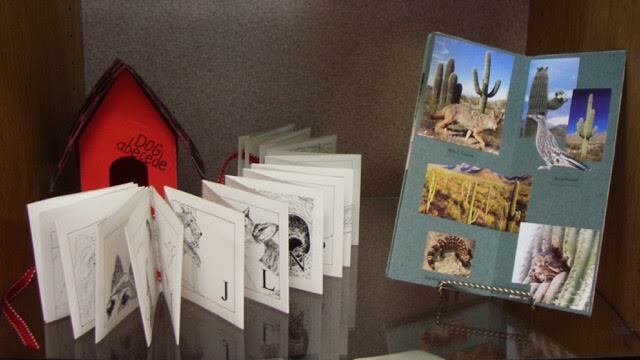 Don't forget, toward the end of the month, the exchange books will be on Flickr. You can see them by tapping Flickr Gallery in the column on the left. The Humboldt County Library Kiosk has a new display featuring books about dogs. 2018 begins the Chinese zodiac Year of the Dog, so we celebrate our "best friends" with this display. 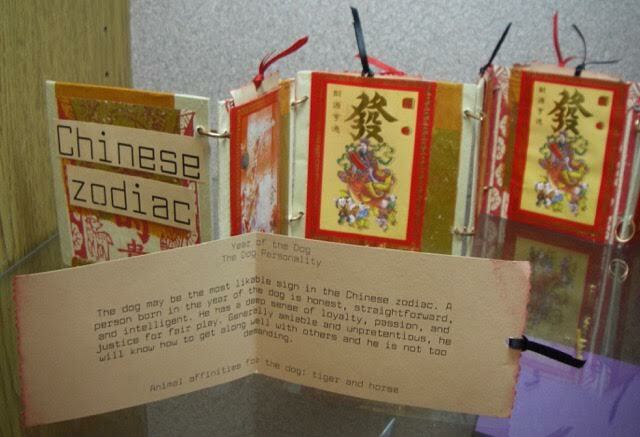 The Dog symbol is 11th in the 12 year cycle of animals in the Chinese calendar. According to information from Wikipedia, the Dog is the symbol of loyalty and honesty. 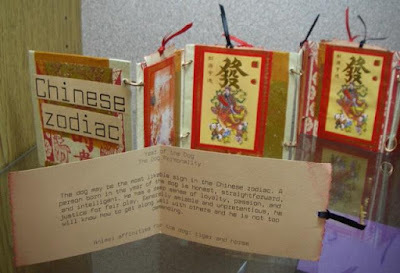 People born in the Year of the Dog possess the best traits of human nature. They are honest, friendly, faithful, loyal, smart, straightforward, venerable and have a strong sense of responsibility. Dog is man's good friend who can understand the human's spirit and obey its master, whether he is wealthy or not. The Chinese regard it as an auspicious animal. If a dog happens to come to a house, it symbolizes the coming of fortune. The invincible God Erlang in Chinese legend used a loyal wolfhound to help him capture monsters. The Years of the Dog include: 1922, 1934, 1946, 1958, 1970, 1982, 1994, 2006, 2018, 2030. The Year of the dog runs from February 16, 2018 - February 4, 2019. 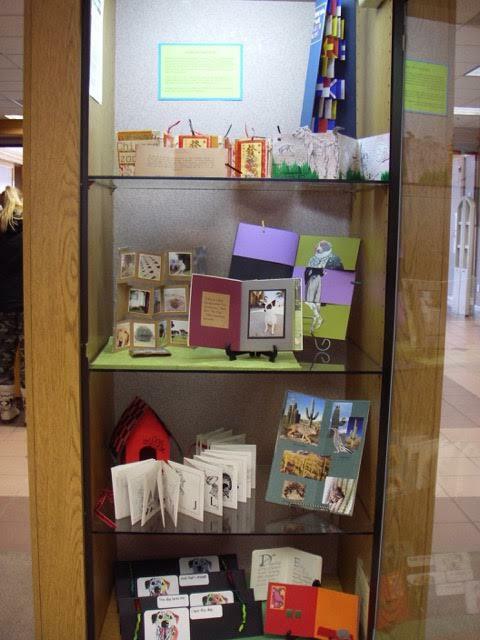 Many thanks to Lynne G for her time spent decorating the kiosk. Since she will now be working on the newsletter, Dianne B will take over the kiosk position. 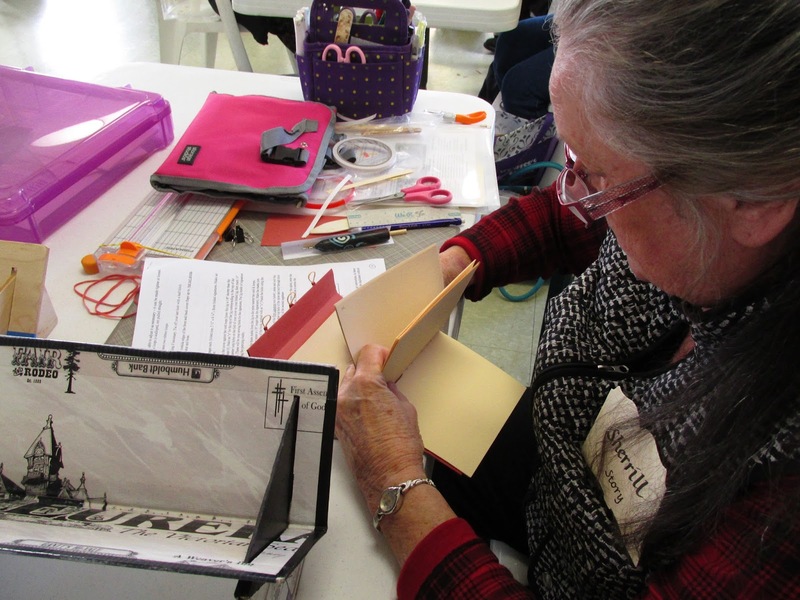 NORBAG artists will have the opportunity to start off the new year with a great workshop taught by Dolores Guffey. 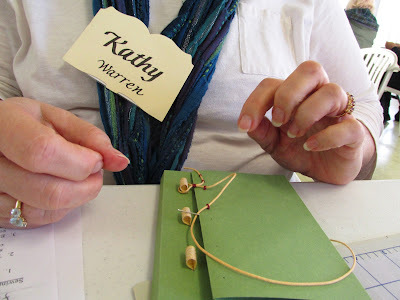 This was one of the closures she learned at a workshop in the UK a couple of years ago. It provides a beautiful finish for a special book. Mi-Teintes or Fabriano paper cut to 16 1/2" x 5 5/8" grain short (note: this paper is available at Ellis Art & Engineering in Eureka or the Art Center in Arcata). Choose any color. 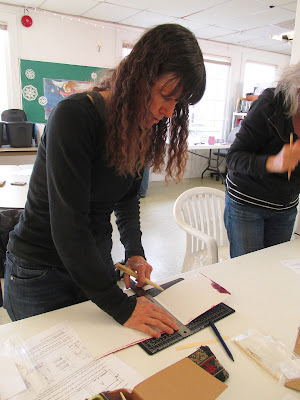 The paper must be cut to size prior to the workshop.